This Texas Longhorns team takes the field one last time to battle Georgia in the Allstate Sugar Bowl on New Year's Day (Photo courtesy of Texas Sports). NEW ORLEANS – Everything is in place for No. 15 Texas to excel when it battles No. 5 Georgia in the Allstate Sugar Bowl Tuesday at the Mercedes Benz Superdome. 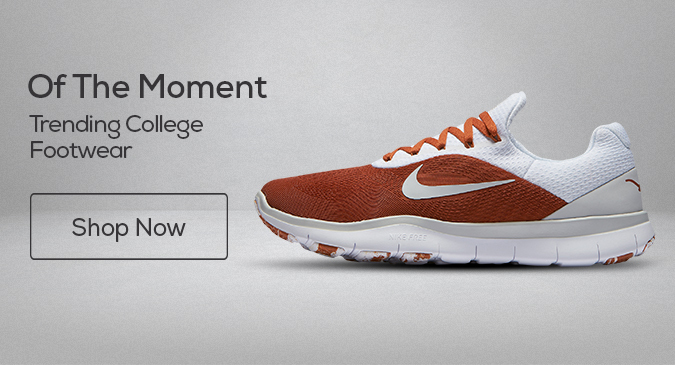 The longer the Longhorns are in the Big Easy, the more things are falling in their favor it seems. Texas already got a boost when Bulldogs' cornerback Deandre Baker, the Thorpe Award winner as the nation’s best defensive back, announced he will sit out the game to prepare for the NFL draft, giving the Longhorns receivers a big advantage. Then on New Year’s Eve, Texas got another late Christmas gift, when Georgia coach Kirby Smart told the media in his final pregame availability that injuries could keep outside linebacker D'Andre Walker, the Bulldogs’ best pass rusher, and noseguard Jordan Davis, the first line of defense in Georgia’s rush defense, out of the bowl game as well. Walker, who leads Georgia in sacks with 7½ and tackles for a loss with 11½, is dealing with a groin injury he suffered in the fourth quarter of the SEC Championship against Alabama. Davis has a minor back problem. Neither has had a full-speed practice with the team while it’s been in New Orleans. “D'Andre Walker has struggled a little bit," Smart explained. “His groin has been bothering him, hasn't been able to go full speed. He'll be a game-time decision, maybe situationally is the way we'll use him. Texas, meanwhile, is as healthy as possible and has had a spirited series of workouts in New Orleans. The Longhorns have taken on the challenge of the underdog role (Georgia is a 12 ½-point favorite in the Sugar Bowl) and run with it, buoyed by their preparation and belief in the team’s one-game-at-at-time mantra. “If we prepare the right way, we prepare the way that we know how to and then we put that preparation into action when the ball is kicked off, that we're going have a chance to be in just about any game,” Herman said Monday in his final media availability before the game. 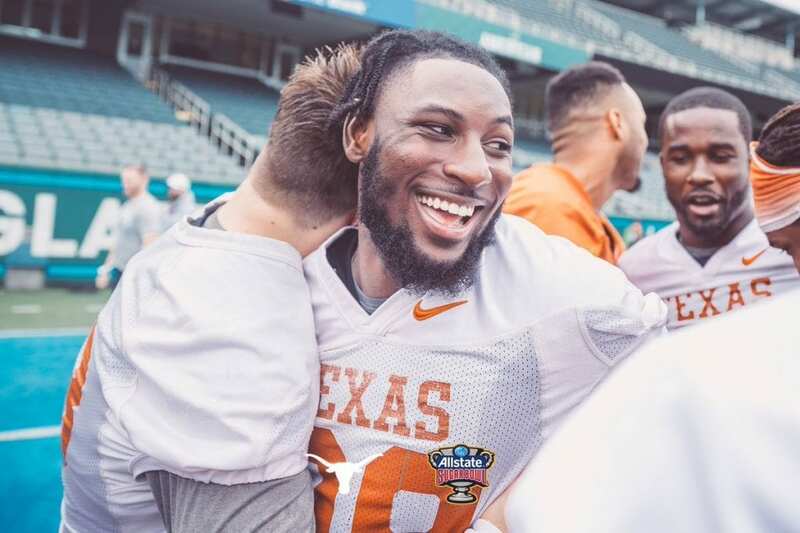 The Longhorns showed lots of love for each other after their final practice of the season ahead of the Allstate Sugar Bowl (Photo courtesy of Texas Sports). 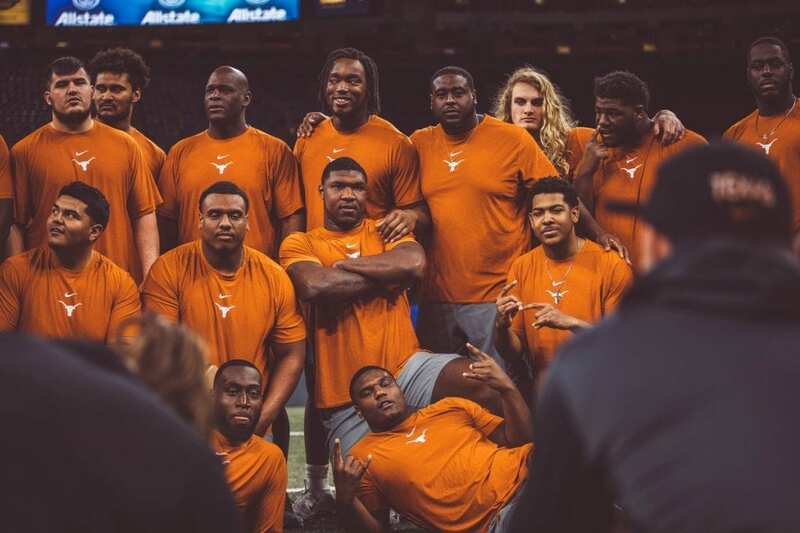 On Sunday the team had its final full-bore practice of the season, after which the seniors were feted and “loved up” by their coaches and teammates for their contributions to returning the Longhorns’ program to prominence. One of the keys to success for Texas in the game is to limit the damage from Georgia’s two star running backs, D’Andre Swift and Elijah Holyfield. Swift (1,037 yards) and Holyfield (956 yards) are trying to become the latest Bulldogs duo to each have 1,000-yard seasons, and are likely the best running backs the Longhorns have faced this season. 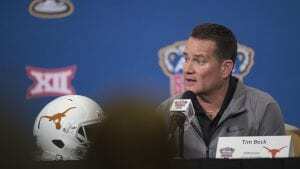 Texas defensive coordinator Todd Orlando addresses the media (Photo courtesy of texassports.com). “They're kind of push button speed guys, and can turn a corner as fast as the guys that we've seen,” Texas defensive coordinator Todd Orlando said about Swift and Holyfield. Offensively, Texas will try to control the game and wants to run the ball. But it’s best plan of attack may be getting the ball to Humphrey and Collin Johnson, who with their size, remain matchup nightmares for opposing defenses. "They're an excellent offensive football team. They're big. They're physical. They run the football. They do a really a good job of stripping the football. They've created a lot of turnovers. We've harped on that consistently for the last month with our players. 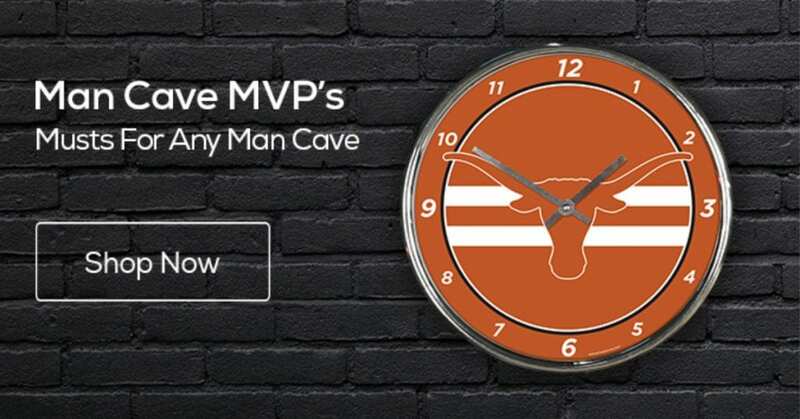 So, I mean, we've got to control the tempo of the game," Texas offensive coordinator Tim Beck said. "We have to play physical and control the line of scrimmage. And we've got to execute — when we have to make those plays, be it a third down, be it a big conversion, a red zone, we've got to take advantage and score points, touchdowns in those red zones. Can't be a field goal game. Got to score touchdowns in the red zone. I know everybody is going to say the same thing when they come up here. That's what you have to do. 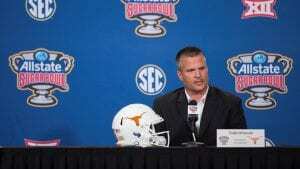 Texas offensive coordinator Tim Beck addresses the media (Photo courtesy of texassports.com). "But that's what we have to do to beat this team. There's no question." Humphrey leads the Longhorns with 79 catches for 1,109 yards and 10 TDs and Johnson had 65 receptions for 945 yards and seven scores. Texas Fight (Photo courtesy of texassports.com). 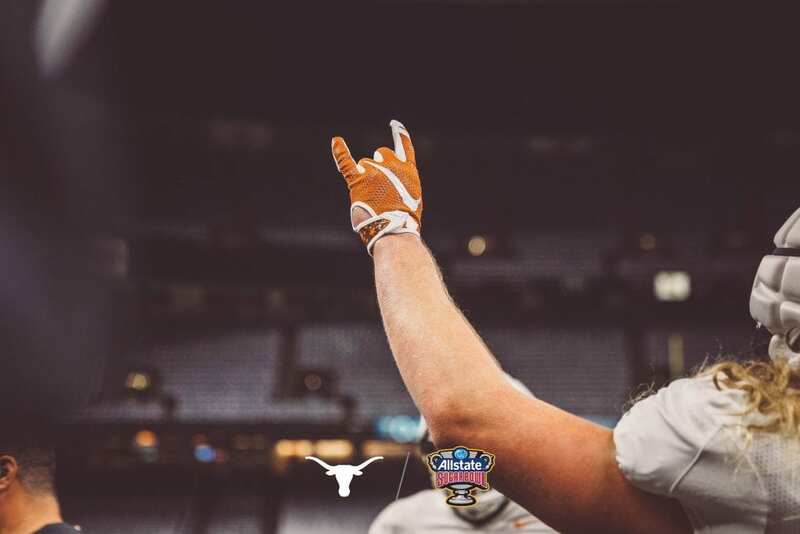 NOTES: The 2019 Allstate Sugar Bowl will mark Texas' fourth appearance in the historic game ... UT is 1-2 in its Sugar Bowl history ... The Longhorns beat Alabama, 27-7, in the 1948 Sugar Bowl, lost to Ole Miss, 39-7, in 1958 and also to Virginia Tech, 28-10, in 1995 in the infamous Ron McKelvey game … The Bulldogs have the second longest active bowl streak in the nation at 22, trailing only Virginia Tech (26) … Texas quarterback Sam Ehlinger has thrown just five interceptions, and attempted a school- and Big 12-record 308 consecutive passes without an interception in between picks in the season opener at Maryland and the regular season finale at Kansas … Georgia is 15th nationally in scoring defense, allowing just 18.5 points per game … Texas makes its 55th all-time bowl appearance, second-most in the country behind Alabama. Georgia is also making its 55th all-time bowl appearance … The Longhorns have played in nine, one-possession games in 2018, going 6-3 in such games. Prior to the loss in the Big 12 title game, Texas’ three, regular-season losses had come by a combined nine points … Outside their loss in the SEC Championship game, the Bulldogs' only other defeat this season came in the state of Louisiana on the road at LSU, where the Tigers defeated Georgia, 36-16 … Georgia also has four wins over ranked opponents this season.